Embodiment of Love & Compassion, Insight and Inspiration, Wisdom & Action, Laughter and Light… Universal Motherhood which accepts and embraces everything, a life of pure giving and celebration. Many people wonder how a little girl from a simple South Indian village came to be known throughout the world as “Amma, the Mother of All.” Motherhood, in its ultimate sense, has nothing to do with bearing a child, but with love, compassion and selflessness. It lies in totally giving one’s self to others. If we look at Amma’s life, this is what we see—someone who has offered her every thought, word and deed for the benefit of others. Giving is the essence. 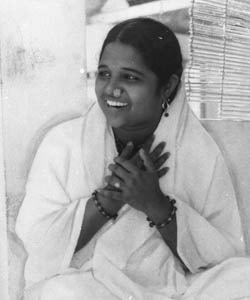 It’s just that when the homeless come crying for shelter and Amma gives them a house, we call her a “humanitarian.” And when the sorrowful come crying for emotional solace and she gives them love, we call her a “mother.” And when those thirsty for spiritual knowledge come earnestly seeking and she gives them wisdom, we call her a “guru.” This attitude of selflessly serving all creation, knowing others to be extensions of one’s own self, Amma refers to as vishwa matrutvam—universal motherhood. And it is to this pinnacle of human existence that Amma is trying to awaken the world through her life, teachings and darshan [divine embrace]. Questions about the nature of the soul, the universe and God; about dharma, love and family life; about meditation and other spiritual practices…. Amma has been clearing the doubts of sincere seekers on such subtle subjects since her youth. She never had a guru nor studied the Vedas, yet she speaks on the truths expressed within the scriptures with wisdom, clarity and true insight. Hers is not an academic knowledge, but the knowledge of one who is ever-established in the Ultimate Reality. It is for this reason that Amma’s simple childhood home has become the spiritual home to thousands—an ashram where aspirants from around the world reside in order to imbibe Amma’s wisdom and realize the Truth that is their real nature. The seeker is instructed as per his level—from the child to the sannyasi [monk]. Seeing the whole world as an extension of her own self, Amma is ever ready to forego her own body’s needs in order to bring a smile to someone’s face, wipe their tears or to simply listen to their sorrows. The sweet manner in which she laughs and jokes with people, shares in their success and failure has endeared millions to her throughout the world. 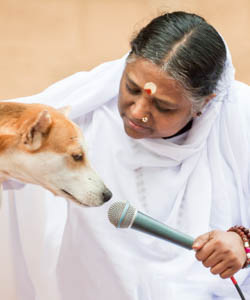 In fact, many see Amma as their lifelong confidant and friend. 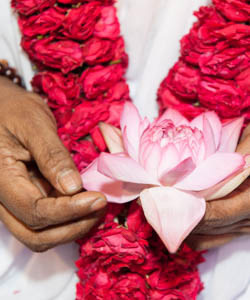 Giving darshan in this manner is verily Amma’s life—day after day, week after week, year after year. 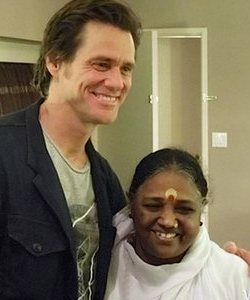 In fact, Amma has been doing so since she was just 17 years old, and she has been known to sit embracing people continuously for as long as 22 hours. Amma is able to make such a personal sacrifice because in her arms people feel safe, feel comforted, loved, feel that finally they’ve found someone who knows them through and through. And with that feeling they get the strength to move forward in life, and this, Amma feels, is infinitely more important than her physical needs. Be they young or old, sick or healthy, rich or poor—everyone receives the same unconditional love. Amma turns no one away. The atheist has just as much a place with Amma as the devotee. For Amma, Advaita [non-dualism] is not a mere philosophy, but something to be lived. As such, Amma’s every thought, word and deed resound with that greatest of truths: Everything within and without is divine. Accordingly, Amma oversees a massive matrix of humanitarian activities. Hospitals for the sick, homes for the homeless, disaster relief, orphanages, hospices, free pensions, suicide-prevention, employment programs… the list is endless. Influenced by Amma’s example and experiencing her pure love, thousands upon thousands of people from around the world have been inspired to take up a life of service—giving whatever time or money they can spare in order to help others. It is the seed of love Amma has planted within them beginning to sprout that has brought this about. This has been Amma’s vision from the beginning. 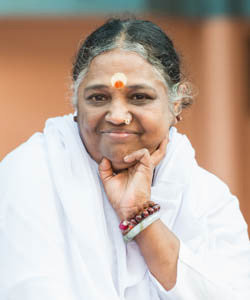 Amma says, “In today’s world, people experience two types of poverty: the poverty caused by lack of food, clothing and shelter, and the poverty caused by lack of love and compassion. Of these two, the second type needs to be considered first—because, if we have love and compassion in our hearts, then we will wholeheartedly serve those who suffer from lack of food, clothing and shelter.” This is the secret behind the success of Amma’s charitable mission and how its expansion seems to be constant and without end. And the brilliance of Amma’s grand scheme is that not only are the downtrodden uplifted but also the volunteers, as the selflessness of their actions purifies their minds, helping them to gradually progress along the spiritual path. Amma’s charitable social services cross all barriers of nationality, race, caste and religion, and have drawn the attention of the world community. 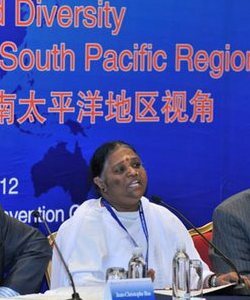 In 2005, Amma’s organization, the Mata Amritanandamayi Math, was given special consultative status by the United Nations. Humanitarian, Mother, Friend, Guru, God…people see her differently. Amma has offered herself to the world. In reality, Amma is beyond all such roles, knowing her true nature to be the true nature of us all—the blissful divine consciousness that pervades this universe. But out of her infinite compassion, Amma comes down to the level of whoever is standing before her—the poor, the lonely, the seeker—in order to give what is desired, what is needed. 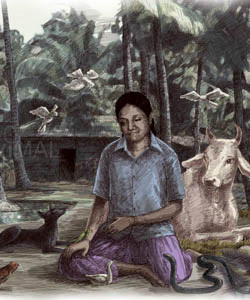 It was for this purpose alone that Amma was born and for this alone that Amma lives today. 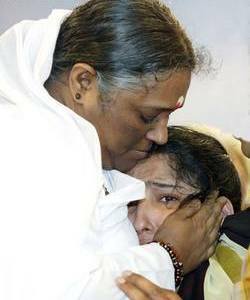 In fact, Amma has said that she wishes to be lovingly caressing someone, consoling them and wiping their tears even when she breathes her last.